Will All the Cool Evaporate When Someone Asks You to Read a Disc? "Apple has to be the most high-profile hardware manufacturer on the planet. Whatever it is that comes out of Cupertino is instantly put under intense scrutiny, and as a rule pundits are divided - some love Apple products, while others hate them. Me, I feel divided. Some Apple products fit in with my lifestyle perfectly, while others just don't light my fire. But one design aspect of Apple's latest product offerings bothers me greatly - and that's the gradual eradication of the user-replaceable battery." "Due to its ultra-thin profile, Apple's new MacBook Air was designed with an integrated 37-watt-hour lithium-polymer battery that is not user-replaceable. Though this has caused some initial concern amongst potential adopters, AppleInsider has learned that the replacement process is quite trivial. "According to people familiar with the new-generation notebook, there are no special tools or knowledge required to swap out the MacBook Air's battery, which Apple has billed its 'thinnest ever' in a product. Instead, the process requires a single size-0 type Philips screwdriver and some diligence." "If the MacBook Air does not feature an integrated optical drive, it can access those plugged to another Mac or PC via the Airport. One can then load an installation CD/DVD in a wireless-enable Mac, and get the MacBook Air connect to it via Airport as confirmed by MacFixIt. "This computer is not alone in the dark as some people heavily claim it, one could even think of having a compact flash-based USB disk as an emergency disc." "Apple officials have confirmed with MacFixIt that the MacBook Air can startup from remote optical media via the Remote Disc function. We asked Janette Barrios, Apple spokesperson for Desktops and Notebooks: 'Does the Remote Disc function allows booting the system. In other words, could you put a Mac OS X Install disc in a remote computer then boot the MacBook Air from that disc?' She answered 'Answer is yes, you can.'" "The MacBook Air's special processor is not the only example of the ultraportable veering away from Intel's reference designs, Electronista has discovered. People familiar with the internal design of the system have explained that the external SuperDrive DVD burner available for the notebook should only be recognized by the Air rather than any computer due to custom requirements from both the subnotebook and its peripheral." "Earlier this week Apple announced its MacBook Air, and within hours we had the mystery of its '60% smaller' CPU uncovered. Or at least we thought. "It turns out there's even more depth to the CPU in the MacBook Air, it's even less conventional than we originally thought. Here's what happened over the past couple of days. "When Apple first made the announcement, we sent an email off to Intel to see exactly what CPU was used in the MacBook Air. As is usually the case with companies that work closely with Apple, including Intel, we got the usual 'you have to ask Apple PR' response. "But by then we'd already pieced together the puzzle and published our article." "Fujitsu rules the subnotebook category with an entire field of entries, coming in every size and shape from true UMPC and up. It's also the first to announce a new model since Apple stormed along with the MacBook Air. The Fujitsu P1620 is lighter, cheaper, and packed with features the Air doesn't have - while lacking some of those it does." "Over the weekend I was discussing the pros and cons of the MacBook Air with a bunch of other tech geeks and we came to the conclusion that the lack of an optical drive is a brave move of Apple's part (a move that other notebook manufacturers are likely to copy over the coming months), but that this could be the feature that's either the deal-maker or deal-breaker. "Bottom line, whether the MacBook Air is the notebook for you really comes down to whether you use the optical drive on your current notebook much...."
Link: MacBook Air - Will All the Cool Evaporate When Someone Asks You to Read/Rip/Burn a Disc? "Quanta Computer aims to achieve an on-year notebook shipments growth of over 25% in 2008, according to chairman Barry Lam. Industry sources estimate that Apple and Hewlett-Packard (HP) will be key contributors to the growth with each expected to account for over 20% sales for the notebook OEM. "Apple, which has just introduced its new MacBook Air, will outsource corresponding assembly orders to Quanta, according to industry sources. Total sales contribution from Apple is expected to surpass 20% this year on an estimated volume of 6-8 million units. Quanta is expected to be the key notebook OEM for Apple in 2008 as the spin-off at Asustek Computer has prompted Apple to shift its orders to Quanta." "Seagate Technology LLC today is set to unveil an updated Momentus laptop disk drive that boosts capacity from 160 GB to 250 GB. "The new 2.5-in. Momentus 5400.4 version includes two disk platters and 8 MB of cache, and it can spin at speeds of 5,400 rpm, the company said. The new version of the storage device is currently shipping, Seagate said." "The Apple MacBook Pro have two very strong things going for it. First, it is the smallest and lightest 17-inch notebook available on the market making it great for people who want a large screen but not have the bulk associated with a desktop replacement. Second, the Mac OS X Leopard operating system let's it also use the Windows operatings system via the official Boot Camp release. This is great for designers needed to work or test in both environments. The downside is that it is a relatively expensive machine for the hardware." Canary Wireless announces the availability of its second-generation Digital Hotspotter device. The first to introduce a WiFi detection and analysis tool with an LCD display providing essential network information, Canary Wireless now brings to market the HS20, featuring a slimmer form factor, an improved user interface, and the superior RF performance that made the first generation Hotspotter an award winner. The HS20 will be available online at canarywireless.com during the first quarter of 2008 and will retail for $59.95. Canary Wireless' offering is theonly device of its kind to provide smart signal analysis, including network ID, encryption status and channel data for 802.11 (b, g, and n) networks. The HS20 now features a slick black mirrored-surface, a slimmer design (2" x 3" x 0.5") and weighs only 2 ounces. It also features many added benefits including a "scroll" feature to toggle between multiple available networks, a backlit display and a larger screen with quick glance icons. "As WiFi users become more and more reliant on these networks as a critical communication channel while traveling, accessories such as the HS20 that provide insight into the network's security and accessibility are becoming essential," commented Steve Deutscher, president, Canary Wireless. According to the latest hotspot report by iPass, a leading provider of enterprise mobility services, a growing number of businesspeople are using hotspots to stay productive on the road. In its WiFi Hotspot Index, iPass found that usage of WiFi hotspots by traveling businesspeople increased by 68 percent between the second half of 2006 and the first half of 2007. "These results indicate that business demand for WiFi hotspots has grown from a novelty to a mainstream need," said Joel Wachtler, VP of marketing and strategy at iPass. PR: The AirMail laptop sleeve is handmade out of durable upholstery-grade vinyl, and lined with fuzzy, soft fleece. All AirMail sleeves have the same dimensions as standard interoffice manila envelopes, which will serve to remind you - and everyone around you - that your new MacBook Air really is the thinnest laptop in the world! Apple's MacBook Air is a revolutionary computer, and we thought we'd take Steve Jobs up on his idea that it can fit inside a standard manila envelope. Besides, we wanted a cool case to show off our new laptops! AirMail laptop cases are lined with thick fleece, which will protect your laptop from any cosmetic damage and smudges, and keep it safe from bumps in daily use. It is not suitable, however, for any extreme use. But geez, treat your MacBook Air kindly! The AirMail is the brainchild of Jona Bechtolt and Claire L. Evans, two Apple geeks with combined handicraft-and-idea-person superpowers! Claire hacked a sweatshirt into a skirt and got some blog attention, Jona and his friend Flint created FlickrBlockrs to protect privacy on the internet, and Jona has some really nice T-shirts he designed for his band for sale here. You can pre-order your AirMail MacBook Air sleeve and expect to receive it via USPS Priority Mail by the time you get your MacBook Air. Ships two weeks from January 15 or when the MacBook Air becomes available. PR: This is a limited edition model of the new laptop bag range - "The Squirrels" - available in five sizes and four colors; our answer to the laptop briefcase. What better way to release this new series of laptop bags than with the "Tony Blair Retirement Special"
The Tony Blair Squirrel Notebook Case has a water resistant 600D polyester shell. 150D ripstop lining. and a brushed polyester lined main compartment. There is a full briefcase organizer, with an expandable filing pocket and storage space, easy access stowable handles, and a removable and adjustable shoulder strap. PR: Belkin International, Inc. announces new Sleeves designed to fit and complement your MacBook Air. 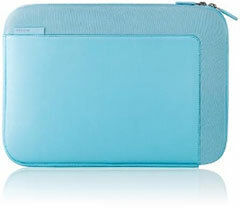 Ranging from neoprene to leather, the Sleeves protect your MacBook Air without adding any bulk. Chris McGugan, Vice President of Product Management for Belkin International, Inc. says: "We are excited to be the first to introduce new sleeves for the MacBook Air. Building off our strength in the iPod accessories category, we are extending this asset to create accessories for the MacBook Air that are stylish, well-designed, and easy to use. In respecting the thinness of the MacBook Air, we've designed our sleeves to complement it by keeping a similarly slim profile." PR: WaterField Designs, a San Francisco manufacturer of custom-fitted computer cases and bags introduces a new laptop SleeveCase made specifically for Apple's new MacBook Air. This protective sleeve ships by Friday, January 25. 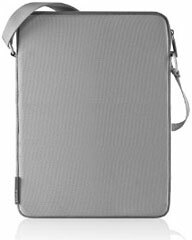 The new SleeveCase is a slim, durable covering made of a sturdy ballistic nylon shell and a high-grade neoprene interior that is customized to the MacBook Air dimensions for a snug fit. Available in either a horizontal or vertical orientation, users can easily retrieve their laptop from a briefcase, messenger bag, or backpack without removing the sleeve itself. 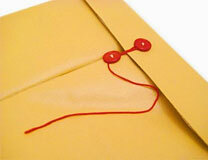 Alternatively, they can opt to add a strap to the sleeve and use it as a stand-alone case. Other options include a front flap for added protection and the "Piggyback," a detachable gear holder for accessories. Frequent flyers can insert the SleeveCase into a wheelie or larger bag to comply with the 2-bag carryon limit. The SleeveCase can also be quickly retrieved and reinserted at airport security check. "To properly protect your laptop, you need a case that fits snugly and is designed to the laptop's dimensions so that it stays cushioned while in transport," explained Gary Waterfield, Chief Designer. "You don't want your laptop bouncing around in a one-size-fits-all case; that's why we have over 50 sizes in stock and continually introduce new ones. 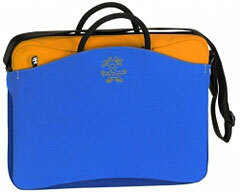 Plus, the neoprene inner shell provides shock-absorbing qualities to cushion your laptop." 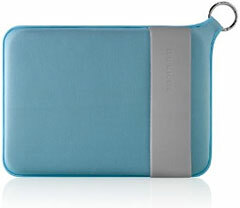 The new SleeveCase size 13-2 for the MacBook Air is $39. Optional accessories for the MacBook Air SleeveCase include: adding a front flap ($15), a suspension shoulder strap and D-rings ($18), the Piggyback ($22). For stowing laptop accessories, WaterField offers the Gear Pouch ($19-$25), the Cable Guy ($19-$25), an iSight case ($24) and a variety of keyboard cases ($29-$49).